So the gallery isn't working right so it might take me some time to update with all of the new photos I have for you. Don't forget to vote for Taylor for the upcoming Teen Choice Awards. You can vote for her here! Also, tomorrow night, Taylor's 60 Minutes episode will re-air on CBS at 7 pm EST. So tune in and watch it!! That pretty much sums everything up until I can get the gallery working properly. Also, I'm still looking for someone to help me run the site. If you're interested, message me and let me know! So as life had it, I never really got the oppurtunity to do much with the sight since Speak Now came out. I feel really bad that it's taken me this long to post something again but work, school, and my life just got in the way. With that said I'm going to try and do my best to update everything and keep you guys posted once again with all the latest news in the Taylor world. But, I'm also asking for someone to help! If you're interested in helping me keep eveyone updated e-mail me here and let me know you're interested. I just need some help updating the galleries and posting all new news related to Taylor! Oh - and I hope you guys like the new layout! I apologize for the lack of updates. Between all the last minute projects and final week, I haven't had time to do much. So let's catch up, shall we? Taylor attended the AMA Awards a couple weeks ago, performing a beautiful mesh-up of "Back to December" and One Republic's "Apologize." She also won Female Country Artist, making it the third year in a row she has won it. If you missed the performance check it out below. Taylor was also on the Tonight Show with Jay Leno on November 23. She talked about award shows, her apartment, and the new album. Missed it, watch it here. Taylor also appeared on Chealsea Lately, and you can watch that here. Also, the tour dates for the Speak Now World Tour were announced, too. If you wanna know if Taylor's coming close to you, check out the dates by clicking here. In other news, Speak Now has been certified triple platinum! Some behind the scenes footage of Taylor's new Cover Girl ad can be watched. It's a short video, but worthwhile. You can watch it below. 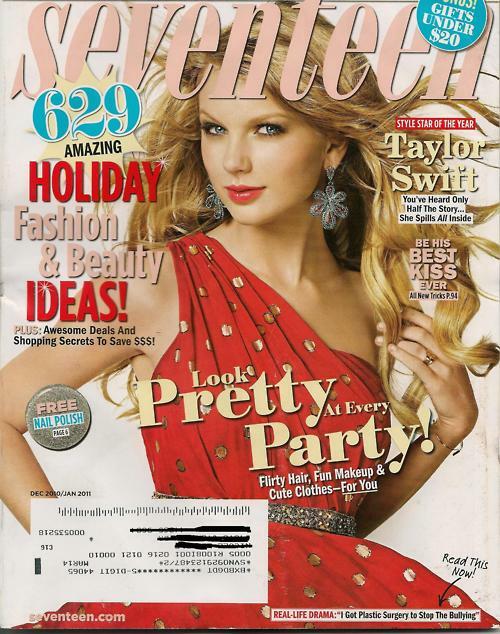 Taylor will be on the cover of Seventeen, yet again. This time she will be featured on the December/January issue! 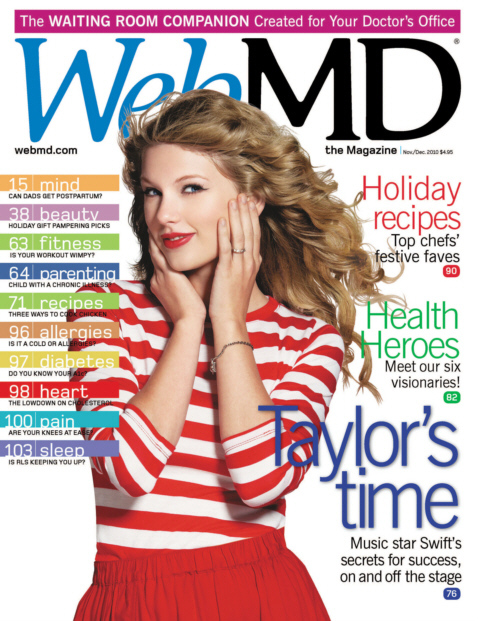 And also, she's on the cover of the November/December issue of Web MD! Taylor will be on the The Tonight Show With Jay Leno show on Monday! So be sure to tune in! If you missed the CMA Awards, you missed an incredible performance of "Back to Decmber"! Watch it below! Taylor also recently won Songwriter of the Year at the BMI Country Music Awards, marking her third year winning this reward. She's currently the only writer who has won this award in three consecutive years, and no surprise the youngest. So congrats to Taylor for the award and the record! So I put up a new layout. It's Speak Now themed, hope you guys like it. Taylor will be on the Ellen Show this Monday. The episode has already been taped and you can check out the promo for it below. Taylor was also on Live With Regis & Kelly last week, where she was interviewed and performed Mine. If you missed it you can watch it below. Taylor was also on the Late Show with David Letterman last week. She was interviewed, once again, and performed "Speak Now". You can watch that below if you missed it. So the contest winners for the Sweety High contest have been announced. The usernames are below! So if you missed part one to the "Journey to Fearless" show, don't sweat it. You can watch it below. And, I also wanted to remind you guys that part two will air tonight at 7 PM EST on the Hub. Also, yesterday Taylor was on the Paul O Grady show. You can check out her interview and performance in the videos below. Some of the tour dates for Taylor's upcoming tour has been announced. Taylor was also on BBC radio, where she was interviewed and performed Mine and Viva La Vida. Check out the performances below. Taylor will be featured on an BBC special that will air on Thanksgiving Day! Taylor called in to kx96 FM (a station based in Canada) for a little chat about her new album. You can listen to the interview here. I've also been updating the gallery, so if you get a chance, check it out.